Thank you for your browse to www.UQSMatrixMechanix... and for your feedback. For a visual illustration of this approach click the UQS Animation "UQS Differentiation"... here... or from the UQSMatrixMechanix.com home page. I think you will find it much easier and faster to digest than a "white paper" on the subject. I am also not a mathematician... I do not work from equations... I work graphically in a 3D digital simulator ... kind of like the difference between theoretical physics and empirical physics. Among other things... this allows me real time visual error checking... and... to use one of Jim's favorite words... a great deal of "transparency". All of the illustrations and animations on my website are actual 3D digital models... they are not artist illustrations. In simplest graphical terms... "guage symmetry"... is a reiteration of Einstein's requirement for a uniform volumetric unit of quantization... i.e. where ever and at whatever scale an event is measured... the "gauge"... or unit of measure... must be constant throughout the field/lattice. The Cartesian coordinate system is comprised of a uniform unit... the cube. It is infinitely scalable ... and it supports gauge symmetry ... but it does not support the concept of g=0... i.e. there is no tensile symmetry... again see the "UQS Differentiation" animation. For further explanation... (in graphical language rather than graphical illustration)... of why I choice a "folded facet" quadhedron as a base unit of volumetric quantization... please click the "Spacetime Precisely Quantized" link... here... or under UQS Theoretical Commentary ... on the UQSMatrixMechanicx.com homepae. In 2000 when I resolved the UQS Singularity... I was very familiar with String Theory and the difficulties the String Theorist were having working from equations rather than graphically. The definition dysfunctions were creating illusion and confusion... for both the theorist and their audience. How is a membrane different than a plane? If a string is 2D... why can it not be called a line? When a membrane turns into a string... or vice versa... it is a matter of convention... but does not necessarily require a restructuring of the geometric framework. Fortunately... I am beginning to see mathematicians... such as early (1994) Unified Field Geometry enthusiast, John Baez... UC Redlands Math Dept.... working with 3D digital applications. A graphical lattice is a very powerful tool... and will become even more so as mathematicians and physicist learn to manipulate them from inside a digital simulator. By applying conventions established by mathematicians to facilitate their equations... mathematics can be quickly and accurately abstracted from a lattice. 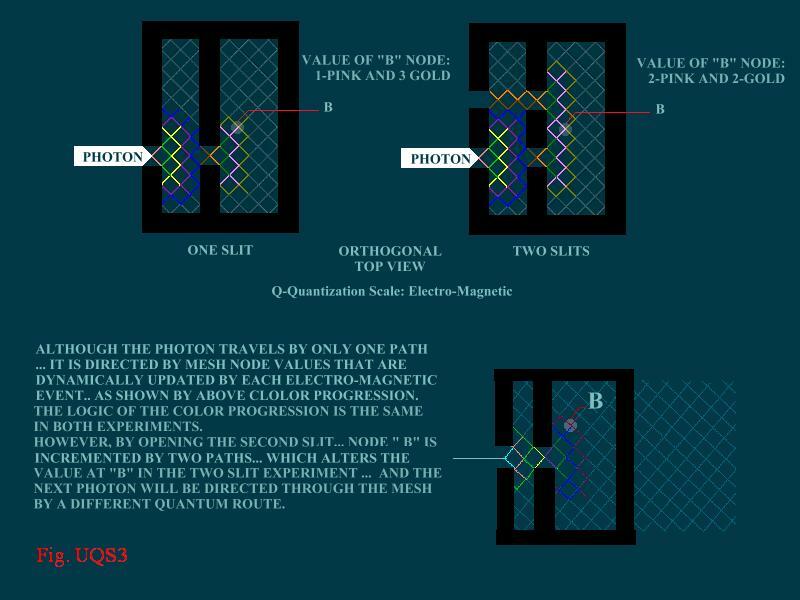 Knowing that conventions can be restrictive... and not knowing exactly what quantum event for which a physicist might make application of the UQS Lattice...I have developed several systems of UQS convention. I have experimented with a 2 Plane notation... requiring a ((Ar,x,y),(Br,x,y)) to label each vertex... a 3 Plane notation... requiring a ((R),(x,y),(x,y)(x,y)) notation... and several others. Nonetheless... each convention is derived from the same UQS lattice geometry... i.e. a uniform field geometry... none are discrete dedicated quantum simulators. Utilizing "curled-up dimensions"... which certainly does not imply an understanding of the scalability and integratability essential to Einstein's requirement for a Singularity... the String Theory "M-Theory" provided a co-dec patch between all the various Sting Theory conventions... but I have yet to see a String Theory Lattice that meets Einstein's requirements for a valid quantum field geometry. What is their uniform unit of volumetric quantization? Working from equations is not necessarily the most intuitive approach... and does not always provide common sense evaluation when things get complex. It is not that the equations derived from experiment and observation are irrelevant. 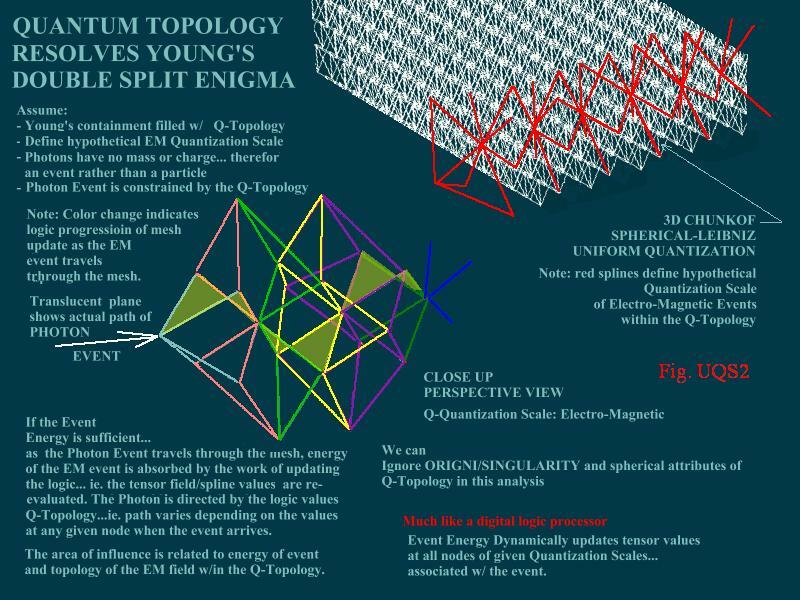 The development of UQS was in part an attempt to determine a volumetric geometry and associated intersection event information state transforms... that would provide path dictates... for a digital simulation of the photon in Young's experiment... and yield the same results as the empirical experiment. Fig.UQS2 and Fig.UQS3 ... briefly illustrate the digital UQS simulation of Young's experiment. It is more the case that equations can be fitted to a lattice... by developing a convention appropriate to one's application... but if there are certain logic requirements placed on the geometry of the lattice in order to support the common sense of the equations... a lattice can not be fitted to equations. Jim tells me you are a busy guy... and I know that over the last 10 years there have been some major events in Particle Physics... which have been highly significant to theoretical physics. In depth evaluation takes a great deal of time... and Edwin I do understand you have done me a great favor in your attention to my work... at Jim's request. Fortunately the internet allows you to browse at your convenience... and interest level... so do feel free to browse by anytime... and to respond or ask any relevant questions that arise from your analysis of either my site or in this "white paper"... which will now appear as a link under Theoretical Commentary on the UQSMM site. Multitasking is essential... even out here in the backwashes of reality.